"Wasn't Sherlock Holmes the most subtle, the strongest among us? Aand if he was brought down, it was because he was dealing with terrible criminals, stronger then he was. Now what's more glorious than, in this case, catching Sherlock Holmes' killer? You're smiling? I'm a woman, that's true, but I have courage. I can go after Sherlock Holmes' murderers." "And when do you begin, Miss Boston?" "I've already begun." 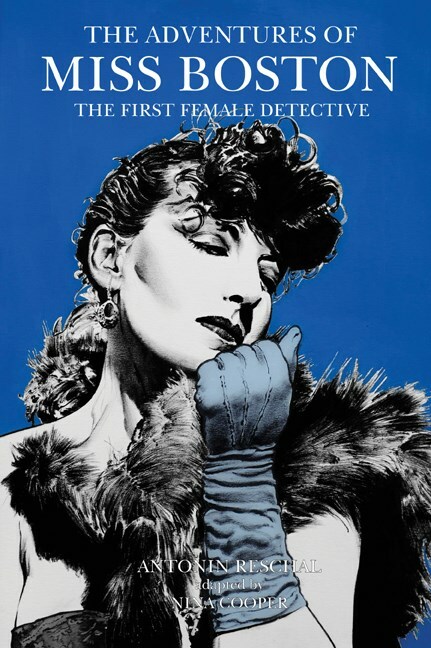 Long before Charlie's Angels, Jessica Fletcher, Miss Marple, and even Judith Lee, there was Ethel Boston, the first female consulting detective in America, a former associate of Nick Carter, trained by famous detective William Hopkins. Miss Boston was the prototype of the New Woman, who believed and fought for sexual and legal equality with men. She was educated, athletic and vigorous, and avoided marriage as it interfered with her self-fulfillment and independence. Miss Boston not only achieved equality, she surpassed it. Created by Antonin Reschal (1874-1935), Miss Boston's adventures and those of her sidekick, Chief Inspector Sokes, ran through 20 installments published in Paris in 1908-09. This book collects eleven of her exploits, including the adventure in which she helps Dr. Watson catch Sherlock Holmes' murderer, and the saga of her battle against the One Hundred Thousand Arms Gang.